Bullets fly on the Atlanta freeway as armed thieves make their getaway following a bank robbery in broad daylight. Unhappy with the results, ruthless gangster Irina Vlaslov orders the men to pull off another job. One member of the team is Marcus Belmont (Anthony Mackie), a crooked cop who gets saddled with Chris Allen (Casey Affleck), his new but incorruptible police partner. As Belmont and his cohorts lay the groundwork for the heist, they come up with a devious plan to use Allen as their pawn. 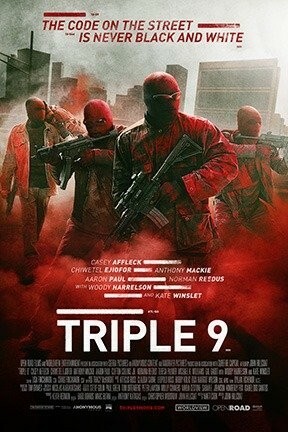 Triple 9 is not showing in any theaters in the area.